Thanks for the opportunity to appear on your blog, Suzan. I’m a wife and mother and I live in the Midlands. 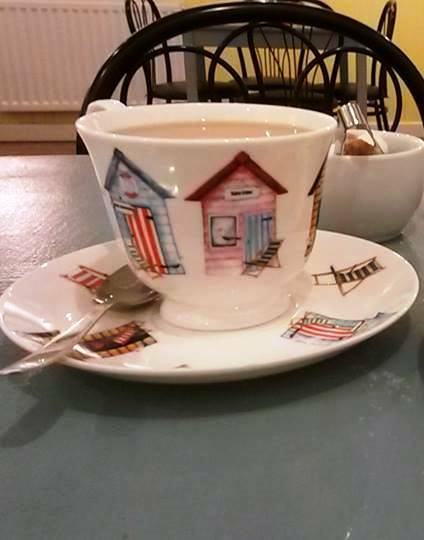 I’m eternally grateful for the wonderful people in my life and tea, wine, holidays and cake… oh, and custard creams. I can’t remember if it had a title but it was about a thief who stole the crown jewels – I was about nine at the time and the story was so long that my teacher typed it up for me and then stuck it on the classroom wall. I was always taught to respect and look after books so reading and being read to was always very special to me as a child. Like so many children I loved the Enid Blyton stories, with Secret Seven being my absolute favourite. I started writing at school and have continued to do it on and off for many years. It has always seemed quite logical to me to write my own stories so I’ve never really questioned why I do it. My question would be ‘why doesn’t everybody do it?’ It’s the best fun ever! It is also the best excuse to sit at a computer, drink tea and eat Olympic quantities of custard creams. 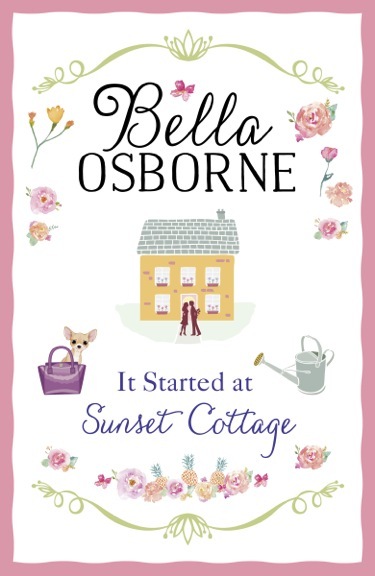 My debut novel ‘It Started at Sunset Cottage’ is out as an e-book on 12th February 2015 and in paperback on 23rd April 2015. It has two strong women at its core. Kate is an author and is consistently calm, reserved and measured whilst Sarah is a sharp-tongued single mother who acts first and thinks later. Timothy Calder, A-list actor and leading man in the movie adaptation of her book, turns up on her doorstep, hoping to lie low after his latest tabloid scandal. But after a rocky start, they find they have a few things in common: a liking for Lady Grey tea, walnut whips and bad ‘knock knock’ jokes. Actually, the bad jokes are just Tim. Sarah on the other hand is trying to hold down two jobs and shut her ex-husband out of her life. When he goes missing she thinks it’s the answer to her problems until Sarah becomes number one suspect. I really wish I had a super intelligent response for this question but the honest answer is that Kate appeared as a character and the ‘what if?’ questions started flying around my head and it all grew from there. I was keen to have two related threads in the story, which I switch between and hopefully make for a compelling read. It is definitely Romance but when it comes to narrowing that down to a sub-genre then it gets a bit tricky. It is a romance novel that incorporates humour with underlying menace and intrigue. It has been described as being both witty and poignant but hopefully readers will enjoy it despite its lack of obvious pigeonhole. What are some of the benefits and challenges to writing? For me the benefits are that I simply love writing. When I’m writing it feels like it’s what I should be doing (apart from being with family, eating custard creams and being on holiday obviously). I get a real buzz when I’m sat at the keyboard and the words are tumbling out and when I typed The End on my first completed novel I felt a huge sense of achievement. The biggest challenge for me is juggling all the other roles that I have in life and squeezing it all into 24 hours whilst retaining what’s left of my sanity. Do you attend a writing group? Not as such but I do attend a local writing course which meets weekly and provides me with a safe environment to share my writing. The tutor and course attendees have been a huge support to me over the last two years. I do. I am very lucky to have a hugely supportive writing tutor, a friendly grammar Nazi, an inspiring agent and a wonderful editor, oh and a lovely husband who I make read it too. I then have a fabulous bunch of beta readers who read it for story and tell me honestly if it’s any good. I have just finished my first attempt at a children’s story, which I’m very excited about and really hope I can find a publisher for. I am also part way through my third novel for adults, which is based in an office and has themes of romance, humour and underlying menace. Seek out other writers. I can’t explain how brilliant it feels to be around other writers. I would recommend joining groups, courses and the myriad of genre writing associations. I joined the Romantic Novelists Association on their New Writer’s Scheme and I have learned so much from their events, met some amazing writers and made some terrific friends. Make time to write. If you really want to write, then something else has to give; be it social media, Candy Crush, television, sleep or the cleaning – trust me in a year’s time you won’t regret not having done those things but you will regret not having found time to write. I work part time so I am lucky enough to be able to dedicate time each week to writing. I also squeeze in time whenever I can especially if I’m in the middle of a WIP or doing something crazy like NaNoWriMo. Even ten minutes can be enough to get a few words down. If you wait for a two hour window it’ll never happen! I am also a big planner so I spend a long time developing my characters, understanding them as people and plotting out the story before I ever put pen to paper, finger to keyboard or custard cream to lips (it’s a kind of reward mechanism). I write a first draft then put it away for about four weeks. I get it out, crack open a new packet of custard creams, read it through and redo the bits that don’t work as I go. I try to focus on each scene and mentally check what it is adding to the overall story and if it’s the best it can be. Then I send it to my agent who tells me what works and what I need more of. Then I send it to my Editor who will make some suggestions for improvement. Then it goes to a proof reader and then we all breathe a sigh of relief. I love the first buds of a story (as long as they don’t pop up when you are trying to finish something else). That stage when you have no idea where the story is going to take you and you have to learn about your characters is the most exciting for me. I’m less fond of the editing. I can read something ten or more times and not spot a typo because I’ve become blind to it. But I do like being able to tinker with it. The hardest bit is letting go. You know what, it’s actually not that important. I can say that because I kept it to myself for years. I never really expected to get published so the fact that real people are going to read it is very scary. But now that it’s happening I truly hope that readers enjoy it. A big thank you to each and every one of them! Thank you for a lovely interview, Bella and good luck with your writing. Suzan.